Zest is a healthy food company serving fresh, healthy, nutritious and delicious food. We offer a menu of freshly pressed juices, freshly blended smoothies, freshly tossed salads, home-made sandwiches, heart-warming soups, hearty wraps, healthy snacks & desserts as well as organic raw coffee. Our passion and focus is to offer our customers not only delicious but nutrient rich food. We do not use additives or preservatives in our food. We use high quality raw ingredients to ensure nutrient rich offerings. Zest has traded in Dubai since 2005. Between 2005 and 2017 we ran a restaurant in the food court of Ibn Battuta Mall. In 2017 we closed our retail outlet in Ibn Battuta Mall and opened a new restaurant & central kitchen close to Arabian Ranches in Arjan, Dubai Land. Our new location offers our customers dine in & delivery and with our larger central kitchen we are now in the process of developing our B2B part of the company. Pop by to see us for a little healthy boost. We are open 07:00 to 22:00 all days of the week. Should you wish to enjoy our products delivered to your doorstep then visit www.zest.ae/delivery or check us out on Deliveroo or Zomato. Zest’s ‘Business to Business’ enables companies the wonderful opportunity of offering their employees healthy nutrient rich food and drink in their offices daily. 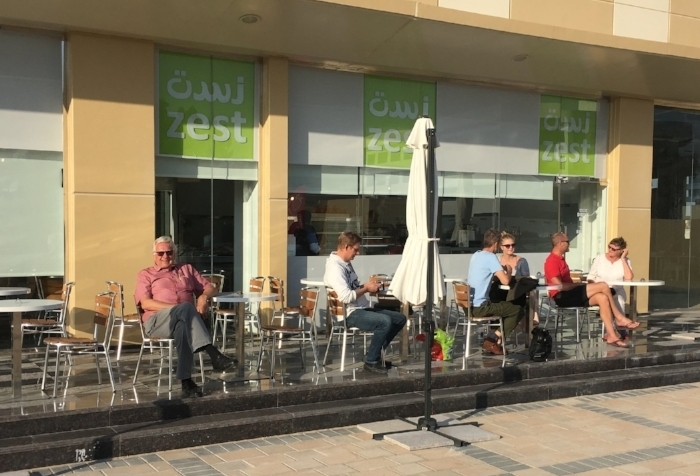 With an offering of juices, smoothies, food and healthy treats (ideal for ‘fika’) Zest has proved popular for the forward thinking health conscious companies across Dubai. Zest B2B also caters for company parties and events. B2B services are also available for Food & Beverage Companies and Retail (white labelling options). Contact us on B2B@zest.ae to learn more about the options available for your company.